Employers may not state the fact so bluntly, but every good employer has a list. Trust me. They may not have an actual physical list, but every employer knows the names of their good employees. Good employees are not overlooked. Good employees are on the list. If you figure out what constitutes a good employee in your workplace—and take action to emulate those actions—you will be on the list. And, there’s the rub. Different workplaces have different definitions of good employees. For example, one workplace may love creative people who bring new ideas to work. Another may cherish employees who can work long hours in a routine job. Subtle differences exist from workplace to workplace. But, I guarantee: the fundamental qualities, of employees who are on the list, are universal. How Do You Know If You’re on the List? Every manager knows about the list and may be familiar with the talents and skills of the employees on the list. Watching out for the careers of the employees on the list is a serious organizational commitment. 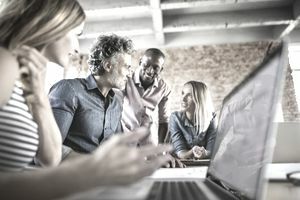 Retaining these employee superstars is considered critical to the future of the organization’s continued growth and success. Consequently, managers are committed to nurturing their talent. You’ll know if you’re on the list. Just look around you. If you’re on the list, you receive more training and other opportunities to grow and develop your knowledge, skills, and experience. You receive more information because the boss trusts you and trusts how you will use the information. You are eligible for more lateral moves and considered when a promotion is available. Employees on the list are an organization’s stars. If you’re on the list, you’ll receive better raises, more aggressive performance development plans, and the largest available bonus. You are asked to head up special projects and invited to attend important meetings. The boss may spend more time mentoring and coaching you if you’re an employee on the list. In the best organizations, the boss communicates your value, and you know you’re on the list. When the list is secret though, look around you. Is your value communicated in the ways described? Or, are you always wondering why another employee got the big break, the big raise, or the sought after promotion? If the winner is never you, you’re not on the list. Your name on the list is good news for your employment and career. But, if you’re not on the list now, are you relegated to the lower echelons of your organization forever? Not necessarily. With concerted effort, you can make it onto the list, but it’s a two-part goal to accomplish. And, it’s difficult to do. First, you need to change how you approach your work. It may mean that you fundamentally must change you. Change bad habits, develop skills, and work hard. Most importantly, you may have to change your attitude, your outlook, and your core beliefs and values. All of these changes are difficult to make. But, there is the second part of this equation that may require even more effort. You will need to convince your organization that you have made the changes, can sustain the changes, and are committed to the new you. When people in an organization have formed an opinion about your work and you, the opinion can last long after it is no longer valid. It is why employees frequently choose to start over with a new job or a new employer. They don't work for show like staying late when the boss does or coming in early so that they are seen as hard workers. They just work hard and accomplish a lot as a result. They exhibit integrity in every business dealing. You trust these good employees always to tell the truth and to exhibit fundamental integrity in all of their actions and their outlook. They don't scam the system, shade stories to make themselves look good, or omit details that are less than positive. Trust is key when you consider an employee with integrity as a good employee. Never satisfied to remain still, your good employees want to grow their capacity as a human being. They want to grow their skills and experience as a valued employee. Good employees want to grow their skills, capabilities, contributions, breadth of influence, positive impact, exceptional results, and more. Good employees take responsibility for themselves and their actions and decisions. They don't finger point and blame others for less than stellar performance or results. They don't make excuses or blame a lack of resources when projects or initiatives fail to work out. Good employees foster teamwork, exhibit well-developed emotional intelligence to understand other employees and work situations and listen to reinforce that they value other employees. Not satisfied to do just their job, good employees exhibit the desire and the will to contribute more to their organization. They help other employees who fall behind. They ask their boss for additional responsibilities and opportunities to add value. Not content with the status quo, good employees constantly look for ways to do their jobs more effectively and efficiently. Each project is reviewed and analyzed. Good employees learn from and change their approach and actions based on the success or failure of their initiatives. Now that you know what performance and behavior will earn for you a place on the list of good employees, why not go there? Your work life will be happier, you will feel as if you are achieving more, your employer will cherish you, and your coworkers will emulate your performance. What's not to love? Take these steps and get on the list.